Like all our prior poll posts, this post takes a moment to memorialize the results we received on the most recent blog poll. 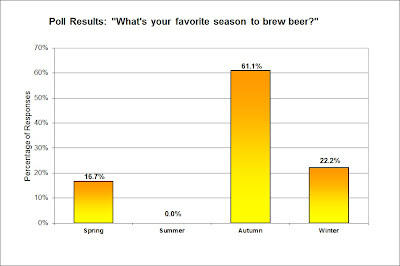 The readers' responses to the question "What's your favorite season to brew homebrewed beer?" are presented below. 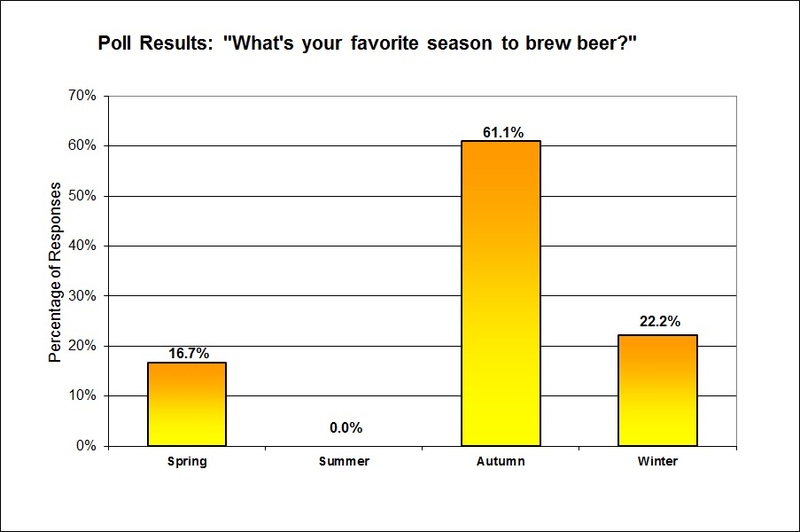 Granted this poll was put out during the autumn, but unless folks just prefer to brew during the season they are currently in, it looks like autumn was the clear winner amongst seasons. Winter was a distant second, which is a bit of a surprise to me (but then again, I'm biased by fact that I brew outdoors that this winter has been particularly snowy for us in New England). The biggest shock had to be that summer got completely shutout - not a single respondent prefers to brew during the summer months. This may be because folks have less free time in the summer with all the outdoor activities and chores clog up schedules, or the heat plays hell on their fermentation (assuming they don't have temp control). But apparently those lazy summer days are just not days for brewing. Let us know what your favorite brewing season is and why. And if you are reading this, our next blog post is up and awaiting your participation. "I'm very picky about my people and my beer."